Today we are going to cover the best cameras for blogging. These days it is imperative that you shoot your own images when you write your blog. It does not matter whether your blog is about travel, fashion, online shopping, photography or anything in between; at times it is impossible to find the precise image that you are looking for. Rather than depend on micro-stock or other sources which mostly provide generalist images, it is a lot easier and convenient to shoot the specific image you are looking for. Anyways, stock photos cost money (in fact, you rater sell your photos on microstock sites). You would argue – so does a camera. But on the other side, if you invest in a good camera, that would last you for years and save you a considerable amount of money and trouble finding the images you need. Not to mention the convenience of being able to produce exactly the images that you need for your blogs. Another big reason for buying a camera and making your own images is the old adage – ‘preach what you pray’. Let’s say that you run a photography blog and most of the images you post to illustrate your blog posts are captured by you. That instantly increases your credibility and therefore the value of your advice. You are more likely to get repeated visitors because your visitors will expect expert advice on a variety of topics related to photography. Which is the Best Camera for Blogging? Unfortunately, there is no easy answer to this question. It depends on your blog and what you write about. It also depends on how good you are with a camera. Further, it also depends on your budget. Thankfully, there is a solution for every budget and every level of expertise. Let’s say that you run a blog on cooking. Most foodies have thought at least once in their life about starting a food/cooking blog. But have shuddered at the prospect of having to take professional quality images of their work. Unfortunately, that’s a problem with most bloggers other than those who write about photography. Assuming of course, that those who write about photography know how to make great images themselves. It is, thus, imperative that the camera that you choose must be easy to operate and should be able to produce great quality images without too much interference. In other words, unless you are writing about photography you don’t need to get involved with the nitty-gritty of advanced camera operations. The Fujifilm X100F is a 24.3-megapixel APS-C X-Trans CMOS III sensor powered point & shoot camera. It is powered by the X-Processor Pro Image Processor which does mincemeat of most photography requirements. The X100F has RAW shooting abilities. The camera has a fixed 23m f/2 lens. In a 35mm format that is the equivalent of a 35mm lens. The X100F has RAW shooting abilities. The camera has a fixed 23m f/2 lens. In a 35mm format that is the equivalent of a 35mm lens. For blogging purposes, the 35mm gives a great viewpoint. It is wide enough to get a near-eye perspective of anything that you might want to show to your audience. It is good enough for a wide angle view of yourself doing a monolog while capturing some of the immediate environment. The native ISO range of the camera is 200 – 12800, which is good enough for low light shooting. The best thing is you can shoot full HD videos at up to 60 fps. Just in case you want to record a quick video clip of yourself. Though fast shooting speed is not always a requirement, it is handy to have. The X100F has a burst rate of 8 fps. Finally, the build quality and the overall looks are reminiscent of rangefinder cameras of yesteryears. There are a bunch of mechanical dials and knobs all across the top and the front of the lens. The successor to the hugely popular PowerShot G7 X original, the G7 X Mark II is built around a 1″ 20.1 megapixel CMOS sensor and DIGIC 7 image processor. It has a fixed zoom lens with the 35mm format equivalent focal length range of 24-100mm. That should cover the entire workable focal length range for blogging purposes. The camera can record full HD videos at a frame rate of 60 fps. Shooting at a higher frame rate allows you to use a lower frame rate when playing back. In essence that allows you to create those magical slow-motion effects. Although it is not a mandatory feature to have as most blogs use the standard 30 fps frame rate. But it is good to have to add some interesting effects to some of the clips. The camera has a stereo sound recording mic that allows you to pick up your voice when recording the footages. Additionally, the G7 X Mark II has a tilting LCD screen that can flip 180 ˚ upwards to face the subject in front. This is handy when you don’t have an assistant to help you shoot. This helps you to have a clear idea of whether you are in the frame or outside of it when recording. The other features include a burst rate of 8 fps, RAW shooting support, built-in Wi-Fi, NFC and time-lapse movie features. The Sony Alpha a7S II we have discussed below is a great overall camera for blogging. It would find a place in this segment as well because of the external mic option. The Canon EOS 77D is a great all-around camera. It is certainly is one of the top contenders for the title of the best camera for blogging. The EOS 77D is essentially powered by an APS-C CMOS sensor with a resolution of 24.2 megapixels. Image processing is handled by DIGIC 7 image processor. The native ISO range of the camera is 100 – 25600. You can stretch it up to 51200 if necessary. The back of the camera is dominated by a 3” 1.04m-dots resolution Vari-angle touchscreen. A vari-angle touchscreen is very handy when shooting video work. Speaking of video work, the EOS 77D is capable of recording full HD videos at a frame rate of 60 fps. What works in its favor is a 45-point all cross-type phase detection AF system for stills and Canon’s fantastic dual-pixel CMOS auto-focusing dial-pixel -CMOS auto-focusing for live-view work (mainly video). The camera also includes built-in Wi-Fi, Bluetooth, and NFC connectivity options. Additionally, there is an option to mount an external stereo mic for the purpose of recording better quality sound. The Sony Alpha a7S II is a mirrorless interchangeable lens camera. This baby is designed to shoot in challenging lighting conditions as well as in situations where you need great video quality. It is built around a 12-megapixel full-frame EXMOR CMOS sensor, and image processing is powered by Sony’s revered BIONZ X image processing engine. A full-frame CMOS sensor with only 12 megapixels resolution means the sensor is likely to produce clean images, even when shooting in very low light situations. Yes, the image sizes would be small, but the trade-off is beneficial. Internal UHD video recording capability (3840 x 2160p) at a frame rate of 24 fps. If you shoot in full HD, you would be able to shoot at a frame rate of 120 fps. The camera is capable of full pixel readout with no pixel binning. Additionally, you can record stereo quality straight from the camera with the built-in stereo mic. Plus, you have the option to mount an external stereo recorder. A neat thing about Sony’s systems is the body-based image stabilization system. The sensor-shift type image stabilization ensures that all compatible lenses are automatically stabilized. The 3” rear articulated LCD screen has a resolution of 1228k-dots and a coverage of 100% of the frame. That is the primary window to compose. But apart from that, there is a 0.5” electronic viewfinder that has a resolution of 2359k-dots. The native ISO range of the camera is 100 – 102400. In the extended mode, you can shoot at up to ISO 409600. If your blog is about photography topics, you need a better camera. The ones listed under the non-photography topic, are good cameras but they lack the creative freedom and power that is associated with interchangeable lens systems. Interchangeable lens systems are divided into two segments – mirrorless and DSLRs. Of course, we are talking about the 35mm segment only. The Canon EOS 80D is an APS-C DSLR with a resolution of 24.2 megapixels and Canon’s DIGIC 7 image processing engine. The EOS 80D is an excellent camera for video work as well as for still shooting. It features Canon’s dual pixel CMOS auto-focusing technology. This technology creates beautiful smooth auto-focusing in live-view mode. The flip-out screen of the camera is perfect as a reference point when you want to keep yourself in frame with no assistant to help you out. The EOS 80D has a 45-point all cross-type autofocusing system. The other features include built-in Wi-Fi, NFC a burst speed of 7 fps and full HD video at a frame rate of 60 fps. The 80D is a great camera for both indoor and outdoor shooting. Being a DSLR has its advantages as you can use different lenses. Plus, you have the added advantage of being able to use an external mic that can record better quality sound. A likely candidate for the best camera for blogging tag. The latest and greatest Rebel, the T7i constitutes some of the best features that have migrated into a small DSLR from Canon’s semi-pro grade cameras. The Rebel T7i features Canon’s dual pixel CMOS auto-focusing. In fact, the first time that a Rebel camera has this. It also has a powerful 45-point all cross-type phase detection AF system. At the heart of the camera, there is a 24.2 megapixel APS-C CMOS sensor and Canon’s DIGIC 7 image processing engine. The camera can record full HD videos at a frame rate of 60 fps. The camera has built Wi-Fi, Bluetooth, and NFC. It can remote controlled for video and still work using a compatible mobile device. Additionally, built-in Wi-Fi ensures that you can backup / share your images and videos over an available wireless network. The flipping screen can swing all the way back 180˚ to face the subject in front. This type of screen is handy for keeping the correct framing when shooting solo. 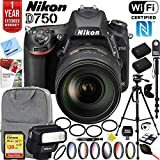 The Nikon D750 is a recent addition to the entry-level Nikon full-frame segment. A full-frame camera is always a better choice regarding video work. As a matter of fact, it is a great choice for any type of still working as well. Except when you need to take advantage of the crop factor that extends the focal length of any lens by a factor of 1.5x (Nikon DX cameras). At the heart of the Nikon D750 is a 24.3-megapixel FX-format CMOS sensor. Nikon’s EXPEED 4 image processor takes care of the image processing work. ISO range of the camera is 100 – 12800. The 3.2” rear LCD monitor has a resolution of 1229k-dots. The screen has an RGBW array that works great even under glaring sunlight. Being a DSLR system obviously, has its advantages as the camera has a built-in pentaprism viewfinder. Unlike some of the crop sensor powered systems that we have discussed here the D750’s viewfinder gives 100% frame coverage. The view is bright and clear. The D750 features an advanced auto-focusing mechanism. An array of 51 AF points (15 of which are cross-type) constitutes it. The feature that is of interest, however, is its full HD video capability at 60 fps frame rate. With it the camera can transfer uncompressed video to an external recorder. This means you can capture the RAW footages which you can process later on. Built-in stereo mic notwithstanding there is an option to mount an external stereo mic as well. An external stereo mic is necessary for the purpose of recording professional quality video. In our opinion, the EOS 80D is the best camera for blogging. Thanks to its dual-pixel CMOS auto-focusing and the ability to record full HD videos at a frame rate of 60 fps. Plus the 45-point all cross-type autofocusing system.